Honey Springs Battlefield – 3 1/2 miles northeast of Checotah, Oklahoma, near Rentiesville. Important battle of the Civil War in Indian Territory. Union Soldiers under Perry defeated Confederate soldiers here on July 16, 1863. Battle of Round Mountain – 10 miles west of Sand Springs on Oklahoma 51. Neutral Muscogee under Opothleyahola defeated Confederate forces of the Texas Calvary on November 19, 1861. Council Hill – Located west of present-day Council Hill — site served as the original seat of Muscogee government after removal to Indian Territory. Nuyaka Mission – Located 12 miles west of Okmulgee. Established by the Presbyterian Church in 1884, after the destruction of Tullahassee Mission. Tullahassee Mission – Located 15 miles northwest of Fort Gibson, near present day Tullahassee. Built in 1894 and run by the Presbyterian Church, this was the largest boarding school built within the Muscogee Creek Nation. Original building burned in 1880. Home of Chitto Harjo – Located near Pierce, Oklahoma — was home of Muscogee leader who opposed the breakup of Muscogee government in the early 1900’s. Home of Opothleyahola – Located near Checotah, Oklahoma, was the home of famous Muscogee leader who lead the Upper Muscogee through violent periods in Muscogee history. Council Oak – Located at 18th and Cheyenne Streets in Tulsa, it designates the Muscogee town of Locapoga, the first settlement of the City of Tulsa. Alexander Posey Birthplace – Located northwest of Eufaula. Posey was a Muscogee poet and political humorist. Union Agency – Located at Agency Hill in Honor Heights Park (Muskogee, Oklahoma), this agency was completed in 1876. It served as an agency for all Five Civilized Tribes. Today, it is a museum and gift shop. Creek Council House – Located at 106 West 6th in Okmulgee, this structure, completed in 1878, was the historic seat of the Muscogee government. Now houses a museum and gift shop. Chitto Harjo Trail – Located at Nichols Park in Henryetta. 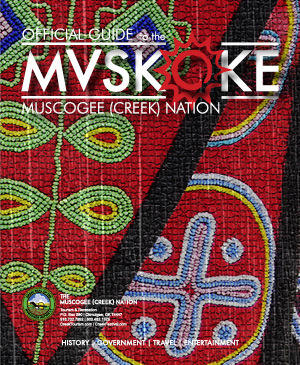 The monument celebrates noted Muscogee leader who fought the breakup of the Nation. Samuel Checote Monument – Located in Okmulgee, this monument honors Samuel Checote, Principal Chief of the Muscogee Nation from 1875-1875. Pleasant Porter Grave Site – Located near Bixby, Oklahoma, this grave site is the burial ground of Pleasant Porter, Principal Chief of the Creek Nation from 1899-1907. Isparhechar Home and Grave – Located off Oklahoma 16, 4 miles west of Beggs. Home of Muscogee leader who directed tribal members during Green Peach War and served as Principal Chief from 1895-1899. Bacone College and Ataloa Lodge – Located in Muskogee, this 117-year old institution is today located on the same 160 acres overlooking Muskogee that the Muscogee (Creek) Tribal Council donated in 1885. Ataloa Lodge Museum houses one of the finest privately owned collections of Native American art in the U.S.
Five Civilized Tribes Museum – Located in Honor Heights Park in Muskogee, this museum depicts the history and culture of the Muscogee Tribe. along with the other Five Civilized Tribes (Cherokee, Choctaw, Chickasaw, and Seminole). Gilcrease Museum – A spectacular museum located on a hill overlooking the Tulsa skyline, this museum has a world-class collection of American and Western art. Thomas Gilcrease was a Muscogee Indian. Old Route 66 – The Mother Road travels through the Muscogee Nation, heading through Tulsa and closely paralleling I-44 through Sapulpa and Bristow (Oklahoma State Highway 66).